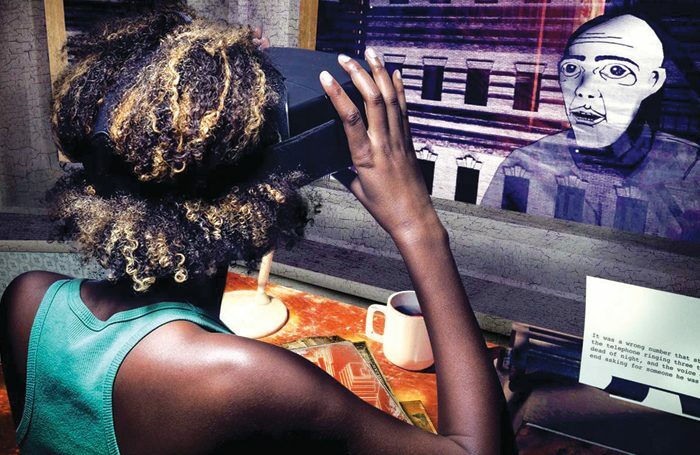 Is virtual reality the future of theatre? It looks like a weird experiment. 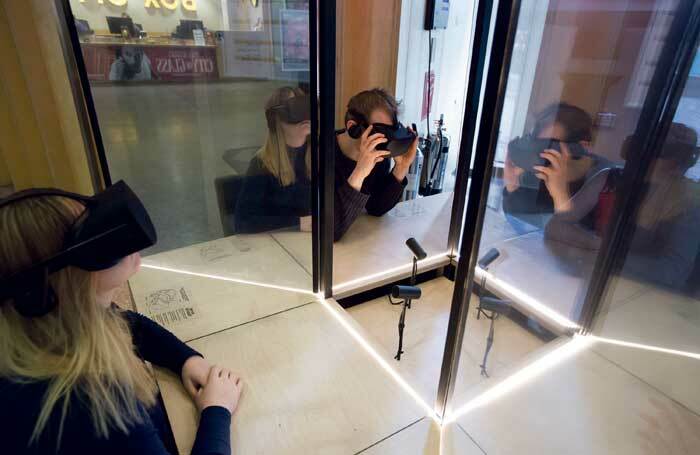 In the foyer of Home in Manchester, four people sit at booths, virtual reality headsets covering their faces. Their heads gently sway for no apparent reason and strange, unannounced movements make for oddly compelling viewing for those in the box-office queue. And then, four minutes later, they unpeel the goggles from their eyes, smiling. They’ve just experienced My Name Is Peter Stillman, a virtual-reality companion piece to 59 Productions’ adaptation of Paul Auster’s City of Glass, currently playing in the main theatre space. It’s a fascinating little work taking place in one room that participants can explore as the character moves in strange ways in front of your very eyes. Jenny Melville’s original set design for City of Glass, like much of her work, was modelled in 3D. It was “a natural progression that the apartment we’d started to design could then be adapted for VR”. The animated face is without doubt the crux of My Name Is Peter Stillman. Ashton laughs that some people don’t realise until the very end that their head movements mirror the protagonist they see in front of them and have sat still throughout the entire four minutes without exploring the room. It’s notable that Warner is honest about the pitfalls as well as the potential of VR for theatre. Ashton says that even this four-minute show has been a lot more work than they thought, taking six months of “tinkering” in different areas before script, design, tech and set were combined at the end in a post-production process more akin to a film. “It’s a very different creative process, and it’s been a big learning curve. The tools to make a VR show are very good, but they’re not as honed or developed as a lot of editing software. It’s still clunky – making a small change can require a huge amount of development. It’s unexplored territory. This is where Stockton comes in. He agrees that a lot of work has gone in for something so short, not least because VR creates huge challenges as far as lighting is concerned. Stockton rendered the props in separate 3D software, then exported them into this experience. Time and money: whether VR will genuinely become another medium to tell theatrical stories lays within these two crucial factors. My Name Is Peter Stillman was produced thanks to funding from the Space, which was keen to make sure digital innovation was used “in a way that enhances or extends the experience”. But it would take a team with Pixar-like backing and patience to consider a full-length show. The credits list for My Name Is Peter Stillman is eye-wateringly long for its four minutes – and then there are the Oculus Rift VR headsets and PCs required to run it. Warner is more realistic. “With the best will in the world, you couldn’t do a two-hour show,” he says. “Not least because I don’t think anyone has come up with a comfortable enough physical or optical user experience that you would be prepared to sit through for any length of time. Grappling with VR’s potential has been as tricky for 59 Productions as the technology itself. It’s left to Stockton to point towards a useful VR application for theatre right now. 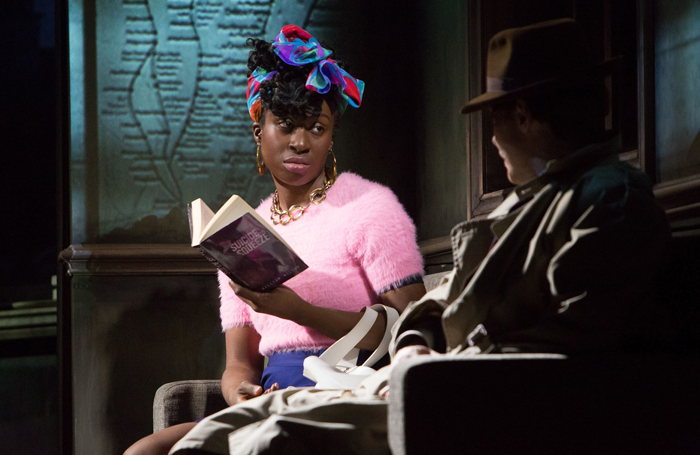 The Green Room: Do you enjoy technical rehearsals?